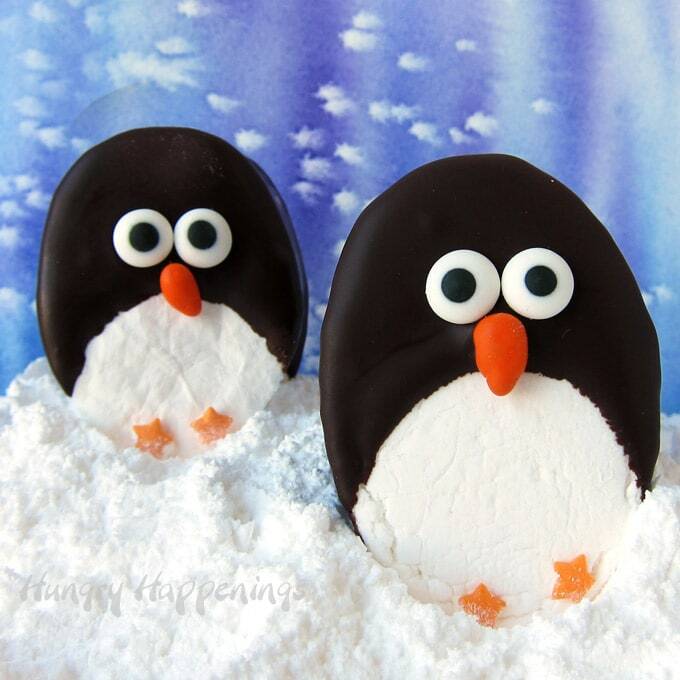 Marshmallow Penguins - Homemade marshmallows dipped in Chocolate. December 11, 2017 By This post may contain affiliate links. Warm up this Christmas with a cup of hot cocoa served with the most adorable Marshmallow Penguins. Each penguin is made using homemade marshmallows dipped in dark chocolate and decorated using candies. Homemade marshmallows have never looked so sweet. Don’t you just love these cute little marshmallow penguins with their tiny orange star shaped sprinkle feet, googly candy eyes, and orange candy coated chocolate sunflower beaks? Each candy penguin is made from homemade marshmallows that have been cut into ovals before being dipped in dark chocolate. These sweet treats would be the perfect thing to serve alongside a cup of hot chocolate on a cold winter’s day. They’d also make fun treats to give away for Christmas. You can package them up in bags, tie a ribbon and attach them to the tops of Christmas presents. Or, how about attaching them to jars filled with hot cocoa mix? I know your friends and family will love getting them as a gift or enjoying them as a snack. If you have never had or made homemade marshmallows, now is the time to give them a try. They are really pretty easy to make and taste unlike any marshmallow you’ve ever had out of a bag from the grocery store. They are so much better! 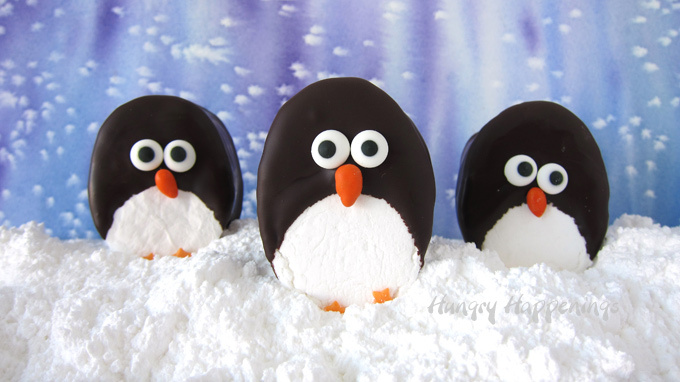 You can see the recipe to make these Marshmallow Penguins over at the Dixie Crystals website. I hope you have fun making these Marshmallow Penguins. I just know you are going to love the wonderful flavor of these homemade candies. Over the years I have crafted several other penguins out of food. 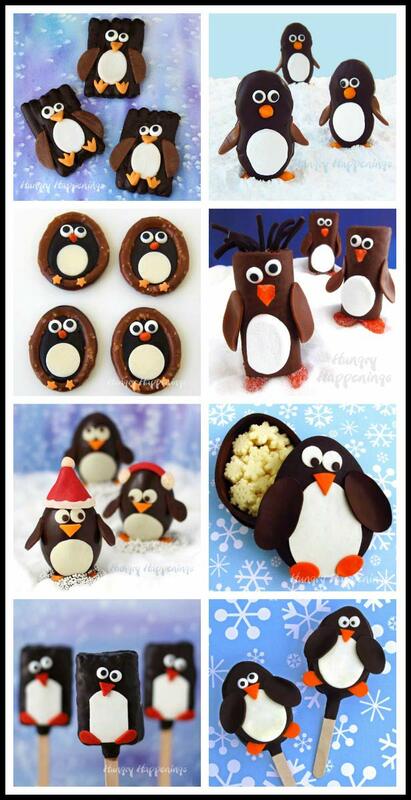 Be sure to check out all my Penguin Food Crafts. From the looks of these and ALL the sweet penguins, you’re every penguin lover’s dream! LOL! I love penguins. They are so cute and make the most adorable treats.